A goat with good dance moves and decent enough marshmallow square-making-abilities is filled with envy when Unicorn enters the scene. What’s so great about making rainbow cupcakes, turning things into gold, and flying? 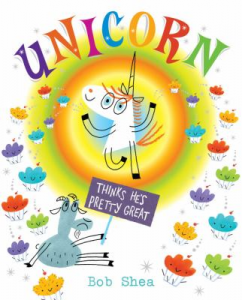 Bob Shea’s Unicorn Thinks He’s Pretty Great tells the tale of a jealous goat who learns that he has some pretty impressive traits of his own – and that good friends can compliment one another with their differences.